Gameplay: tactical shooting game i should say. u can always go out and simply shoot people but to be the best, use less lethal attacks. so i ended up learning on shooting with tranquilizers and using the MK-2 for electric shocks. its different from the previous games i’ve played. 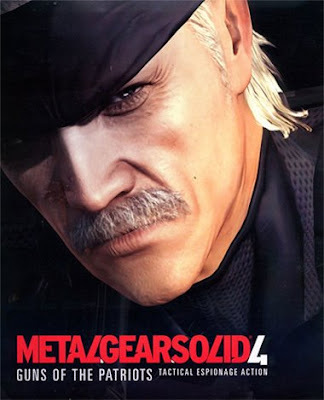 since i’ve never had any experience with PS2, this MGS4 is totally a new experience for me. the storyline was movie-like. u are part of the storyline.. you are Snake. u felt his sadness. u feel how he feels. no wonder this game have so many followers across the globe. Graphics: satisfactory. the cut-scenes was nicely displayed. characters are very detailed. the ladies are extremely gorgeous. even the tear-drops are detailed to the very inches. Worthiness: pretty good buy for the storyline. haven’t played online with this. after 6 months from my previous review of my games, finally i came up to make the second review. but this time just fot MGS4. i haven’t finished GT5P yet. not without the stable G25 table i guess but soon i might just have that..
i’ve just recruited another 3 new games. Modern Warfare 2, Assassin’s Creed 2 and Demon’s Souls. recently i’ve got NFS: Shift as a temporary exchange with a friend of mine. 4 games in hand. 2 currently in progress. Shift was awesome so far. currently at 13% progress. the other being Demon’s Souls. tough as hell. might give up on playing this game soon. but we’ll see how far can this carry on. no Xbox 360 game listed this time. i’ve modded my Xbox 360. why mod it? i’ve supported the industry by buying originals on my PS3 and earlier the Xbox 360. but Xbox 360 requires further payment to play online of which i don’t quiet agree cause i’ve paid such hefty sum to buy the console, the game and internet connection. then they want me to pay more just so that i can play online. mod it and enjoy offline gaming. but there’s always some risk playing with a modded console. some? haha.. my Xbox 360 just got banned few months back. access to HDD was blocked. i haven’t revive my Xbox 360 yet. maybe soon. the plan is there but doing it consumes time. that’s what i don’t have much. as for now, my Xbox 360 lies quietly in my room. no new games on Xbox 360 then..
listed here are my used Playstation 3 games on sale. all games are in excellent condition. all games are complete with manual and inside box. price are stated in Ringgit Malaysia (RM). preferable cash on delivery. cost of either postage or shipment to be paid by buyer. my prediction was wrong all over. france had their worst world cup tourney i guess as the finished bottom of group A. south africa fought well but did not get through based on goal difference. uruguay was far better then i expected. mexico was way better than france. no doubt the two qualified. as i predicted, argentina had no problems qualifying. greece and nigeria didn’t do enough to qualify. south korea showed some fast attacking with lots of running and they deservedly qualify as runner-up to argentina. my choice was england but they struggled to qualify. the usa showed some good football to top group c while england was lucky to go as 2nd place. as much as i predicted, the four teams fought hard to the last group game. all had their eyes on the round of 16 but germany and ghana squeezed through at the end. no shame to aussies and serbs as they played well through this group stage. netherlands had no resistance from their opponents as they advance as champion of group e with maximum 9 points from the three games. cameroon didn’t do well this time in comparison to the previous world cup edition. denmark played ok but japan surprised everyone with their pace and set-piece ability. japan qualified to the next round proving that asia is not that far behind in football arena. no goal galore and surprisingly italy had a dismal tournament. they finished bottom with only 2 points from two draws. even new zealand was better than italy in this group. what explanation can marcello lippi do to justify this italian job? paraguay and slovakia emerge victorious from this lot..
its that easy. ivory coast tried to challenge but the two nations are too powerful for them. i thought spain had an easy group here. surprisingly they lost to switzerland and had to wait on the last group game to book their spot in the next round. chile accompanied spain in 2nd spot. Uruguay to win this despite tough challenges by South Korea..
balanced game although i quite like Ghana gameplay better..
from group games, England had a bad start and Germany was somewhere in between. but im a Germany fan. so i’d go with Germany..
Netherlands might be too strong for Slovakia..
Not going to be easy for Brazil but they’d get through. Paraguay seems to have slightly better chance to advance from here..
the game to watch in this knock-out stage. both had a good chance to move on from here.. anyhow i choose Spain. The eyes of the African continent will be focused on Ghana as their only representative with a realistic chance of making it to the second round. After some good displays in their win and draw thus far, facing the experienced Germans in their final game is a tall order, but not one that is beyond them. Having coped admirably with the loss of Michael Essien before the tournament, Ghana have impressed more than any other African side with their style of football and won’t be expected to lie down as Germany look to rebuild their form after a crushing defeat to Serbia. In fact, the Germans are under a great deal of pressure as a point will not be enough to secure their progress if, as expected, Serbia beat Australia. And they must manage without Miroslav Klose, who was sent off for a second yellow card against the Serbs as well. Coach Joachim Low has targeted the Africans’ fitness and stamina as something to watch out for and revealed that ”fitness is written with a capital ‘F’ in the Germany squad” so he remains confident of progress. Ghana player to watch: Kevin-Prince Boateng. The focal point of Germany’s anger before the World Cup as he injured Michael Ballack in the FA Cup final – thus ruling the Chelsea midfielder out of the tournament – Boateng actually spurned Germany’s advances and chose to play for Ghana before the tournament as well. You couldn’t write such a story but, amidst some loud booing from the German fans, he will surely have an impact on the match. Germany player to watch: Bastian Schweinsteiger. If the Germans are to make it through the group, the Bayern man will have to show a lot more than he did against Serbia. Often caught up in a heated discussion, Schweinsteiger’s head has to keep cool against a physical Ghanaian side, but he has shown in the past that he has the experience and skill to rise to the big occasion. Key Battle: Asamoah Gyan v Per Mertesacker. Gyan has netted 50% of Ghana’s goals in the World Cup so far (three out of six) and uses his pace and strength up front to cause problems for defenders. One of the star performers at this tournament, his nerve from the penalty spot has been tested already and he has shown no fear in his attacking forays; but he comes up against a 6′ 5” defender that won’t shirk a physical challenge. Mertesacker oozes class on the ball and has the positional sense to make vital interceptions with his giant frame. He will have to cover if Ghana choose to attack the right side of defence (and 5′ 7” Philipp Lahm) from the air. Trivia: Germany have won their final group matches in the last four World Cup tournaments, without conceding a single goal in the last three and, before Serbia, had not lost a group game in 24 years. In the preliminary stages of the 1986 World Cup they were beaten 2-0 by Denmark. Stats: Germany have won all of their last 11 games against a non-European or South American side at the World Cup finals, keeping a clean sheet in five of the last six of these; while the last three goals scored by Ghana in the World Cup have all come from the penalty spot. Prediction: Ghana have the passion, the support and a burning desire to make an impact on their own continent, but Germany are ruthless and experienced in this situation and it would be a shock if they didn’t progress. soccernet wrote this… a must watch game no matter how late this will be. the germans must win this! viel Glück! Having coped admirably with the loss of Michael Essien before the tournament, Ghana have impressed more than any other African side with their style of football and won’t be expected to lie down as Germany look to rebuild their form after a crushing defeat to Serbia.In fact, the Germans are under a great deal of pressure as a point will not be enough to secure their progress if, as expected, Serbia beat Australia. And they must manage without Miroslav Klose, who was sent off for a second yellow card against the Serbs as well. Coach Joachim Low has targeted the Africans’ fitness and stamina as something to watch out for and revealed that ”fitness is written with a capital ‘F’ in the Germany squad” so he remains confident of progress.Ghana player to watch: Kevin-Prince Boateng. The focal point of Germany’s anger before the World Cup as he injured Michael Ballack in the FA Cup final – thus ruling the Chelsea midfielder out of the tournament – Boateng actually spurned Germany’s advances and chose to play for Ghana before the tournament as well. You couldn’t write such a story but, amidst some loud booing from the German fans, he will surely have an impact on the match.Germany player to watch: Bastian Schweinsteiger. If the Germans are to make it through the group, the Bayern man will have to show a lot more than he did against Serbia. Often caught up in a heated discussion, Schweinsteiger’s head has to keep cool against a physical Ghanaian side, but he has shown in the past that he has the experience and skill to rise to the big occasion.Key Battle: Asamoah Gyan v Per Mertesacker. Gyan has netted 50% of Ghana’s goals in the World Cup so far (three out of six) and uses his pace and strength up front to cause problems for defenders. One of the star performers at this tournament, his nerve from the penalty spot has been tested already and he has shown no fear in his attacking forays; but he comes up against a 6′ 5” defender that won’t shirk a physical challenge. Mertesacker oozes class on the ball and has the positional sense to make vital interceptions with his giant frame. He will have to cover if Ghana choose to attack the right side of defence (and 5′ 7” Philipp Lahm) from the air.Trivia: Germany have won their final group matches in the last four World Cup tournaments, without conceding a single goal in the last three and, before Serbia, had not lost a group game in 24 years. In the preliminary stages of the 1986 World Cup they were beaten 2-0 by Denmark.Stats: Germany have won all of their last 11 games against a non-European or South American side at the World Cup finals, keeping a clean sheet in five of the last six of these; while the last three goals scored by Ghana in the World Cup have all come from the penalty spot.Odds: Ghana (6.00), Germany (1.53) and a draw (4.20) are all available at Bet 365, but Asamoah Gyan to score first and Germany to win 2-1 gets you 81.00Prediction: Ghana have the passion, the support and a burning desire to make an impact on their own continent, but Germany are ruthless and experienced in this situation and it would be a shock if they didn’t progress. If Germany appeared at ease with the controversial Jabulani ball in beating Australia 4-0 it was with good reason. While most nations may have been caught out by adidas’ unpredictable creation, it has emerged the majority of the Germans used it at club level over the past six months. Nike remain the official ball suppliers to the Barclays Premier League, but Bundesliga clubs were at liberty to use any ball of their choice last season, thus enabling them to take immediate delivery of the Jabulani when it was launched. Germany striker Mario Gomez, of adidas-backed Bayern Munich, scored the first goal with the ball in a 2-1 win over Borussia Moenchengladbach on December 4, and admitted Joachim Low’s squad are better prepared. ‘Once you have learned to make proper contact with the ball, you can make it travel very fast,’ he said. Schalke’s Manuel Neuer coped comfortably with everything Australia threw at him, but one of his predecessors as Germany’s No 1, Timo Hildebrand, expects more goalkeeping mishaps to rival Robert Green’s. Germany centre back Per Mertesacker described it as ‘like a small cannonball’, while his team-mate Marcell Jansen added: ‘It seems to have been made more with strikers in mind than defenders or keepers, because it is so crazy and unpredictable. oops… nevertheless i still support Germany.. good start! read this from DailyMail. the news is outdated.. but its heartbreaking. people hate it so much. most of us had to endure this and move on. some decided to sacrifice the feature and some reluctant to do so. im in the second group. hoping for either sony opens back the otheros feature or hackers to find a way to elude the blockade. ever since this update was up, i have yet to connect my ps3 to the net. the online gaming is quite a loss for the moment but im not playing much game lately. a couple of months passes by and still the update is still there. despite thousands of comments on the net expressing their anger, distrust and all sort of frustration, sony remains quiet on this matter. i bet the hackers are working hard as well. took geohot 3 years to break the ps3. how long would it take to break this firmware? hope… article from Playstation.Blog.